You’ve taught them how to do their laundry, brought them a year’s supply of toothpaste and shampoo, and lectured them on the do’s and dont’s of life beyond your home. The time has come for your child to leave for college — but are you prepared to say goodbye? 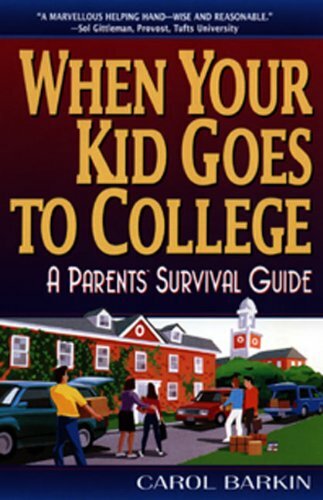 Written by a mother who survived the perils of packing her own child off to school, When Your Kid Goes to College provides supportive, reassuring, and helpful tips for handling this inevitable but difficult separation. Teaching your child how to live on his own, from balancing a checkbook to dealing with a roomate. The difference between financial and emotioanl dependence — and how to keep them separate. Helping your spouse, younger children, and even pets deal with the transition when your child leaves — and when she returns. How to fill — and even enjoy — the hole that your child’s absence leaves. Saying goodbye isn’t the end of the world; it’s the beginning of an exciting new one for your child-and you!